Talad Phlu is an old residential area on the Thonburi side of Chayo Phraya river. This is were you go authentic, even if tourists have started to pay more attention to the area. Tek Heng, aka Jeen Lee, is well know by locals for her Mee Krob and other Chinese and Chinese inspired dishes. 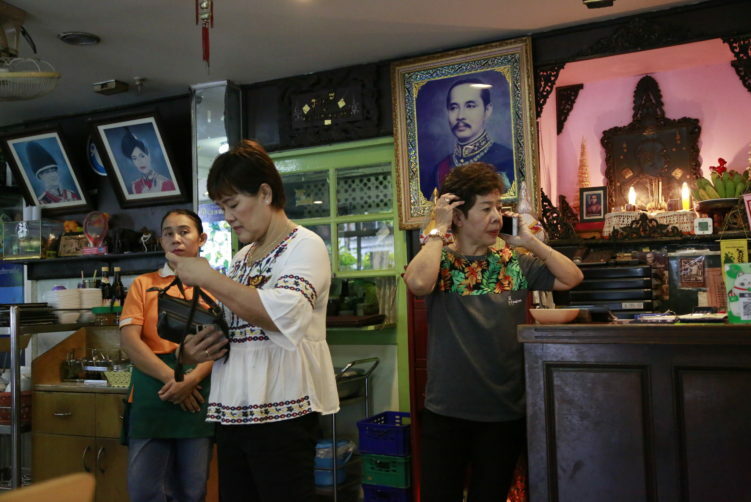 She claims to have served King Rama V.
Talad Phlu is where the Chinese settled first, before migrating to what is today’s Chinatown in Sam Peng. When the Chinese left, the Muslims soon moved in, bringing with them the Thai medicinal herb Phlu (betel leaves) and cultivation culture. The area soon got it name Talad Phlu from this activity. Today, it is a widely known marked with plenty of tasty Thai food to dig inn on. Besides that, Talad Phlu is an area that still has some kind of genuinely left, not wiped out by the skyscrapers decease on the other side of the river. Talad Phlu is where you should head if you want to do like the locals do. It’s still close to a tourist- and hassle-free area, but with plenty of dining options. And yes, if you wondered, it’s cheap as well. Tek Heng, aka Jeen Lee, is at the far end of the Thoet Thai road soi 18, almost on the border to the Bangkok Yai canal and a two minutes walk from the railway station. As mentioned, Tek Heng have been serving King Rama V, meaning they have some years on their back. 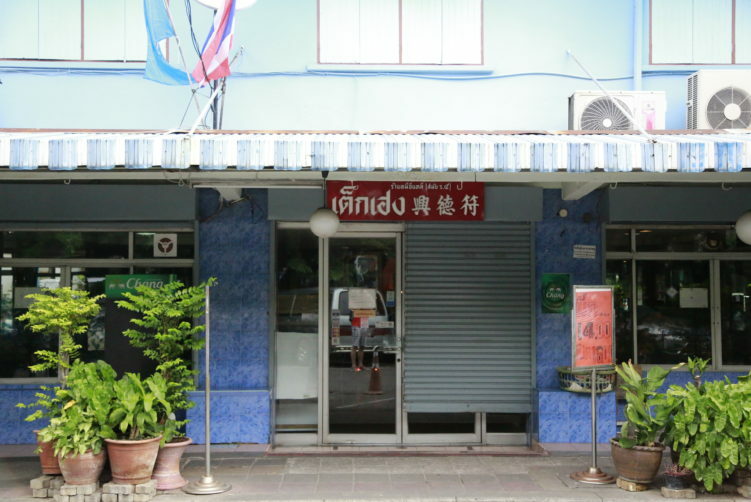 It has actually been run by the same Thai-Teochew family for more than 130 years. Back in those days Tek Heng was a floating restaurant by the Bangkok Yai canal nearby, but these days their restaurant takes up 3 shophouses on steady ground and is a popular lunch spot. 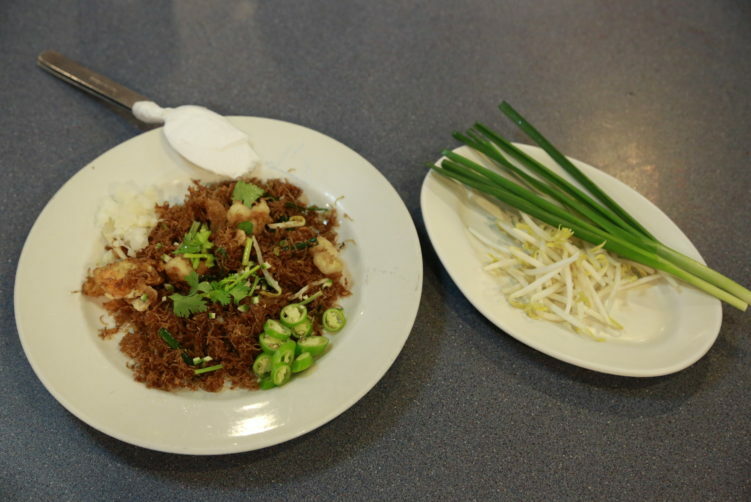 Tek Heng are most known for their mee krob, that is crispy noodles flavored by palm sugar and tamarind. Then they mix in shrimps, pickled garlic, beansprouts, Chinese parsley and chives. And some bits of not to spicy chili. 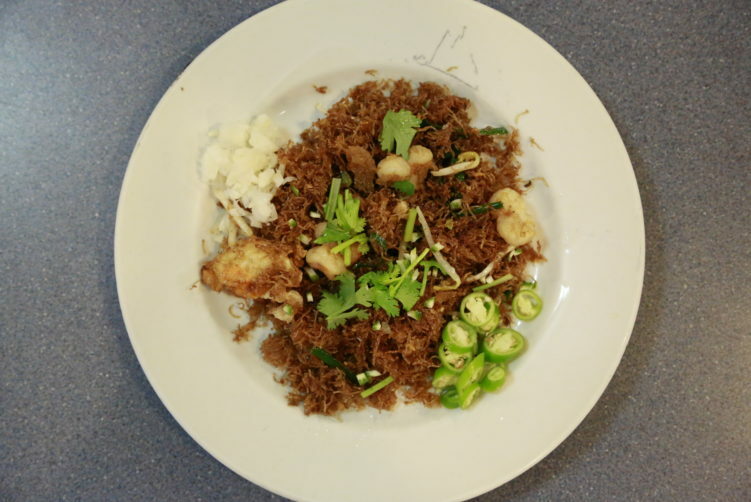 The raw beansprouts and chives is balancing the sweetness and tartness from the palm sugar and the tamarind and is really necessary to keep the dish in balance. Personally I still find the dish slightly to sweet, but as we all know, Thai’s do have a sweet tongue. In other words, ask them to be careful on the sugar when ordering. It comes with a slice of lime on the side, and you should use it. Most other dishes at Tek Heng also have strong Teochew style to it, including the Hae Cho, minced pork meat and crab meat that is wrapped in beancurd sheets and deep fried in the wok. It is served with a typical plum dipping sauce. They are crisp and much lighter than you would think before biting into them, showing their skills in the making. It’s slightly peppier and a bit more tastier than what you get elsewhere, for example in Singapore. They do have a few Isaan food dishes on the menu as well. The level of english is rather low or even close to non existent. It shouldn’t be to much of a problem. The atmosphere is relaxing and something between a cantina and restaurant kind of feeling. Some waiting time if you come prime time lunch. They do have parking if you you’re a four wheeler. The menu is extensive so I would expect the quality to differ a bit depending on your order. order now Food: Thai-Chinese (Teochew). Most famous for their Mee Krob. click here Price: A bit pricier than your average spot, but kind of reasonable unless your on a tight budget. cheap generic viagra mail order pharmacy Open: Daily 10am – 10pm (closed between 2pm – 4pm). Closed third Monday of the month. How to get there: Take the BTS to Talad Phlu station. Take exit 4 and you have a 10 minutes walk from there. Talad Phlu is an old residential area on the Thonburi side of Chayo Phraya river. This is were you go authentic, even if tourists have started to pay more attention to the area. Tek Heng, aka Jeen Lee, is well know by locals for her Mee Krob and other Chinese and Chinese inspired dishes. She claims to have served King Rama V. See full review at StreetsideBangkok.